Not to be confused with Samara Mosque or Al-Askari Shrine. The Great Mosque of Samarra (Arabic: جامع سامراء الكبير‎ or المسجد الجامع في سامراء or مسجد سامراء الكبير) is a ninth-century mosque located in Samarra, Iraq. The mosque was commissioned in 848 and completed in 851 by the Abbasid caliph Al-Mutawakkil who reigned (in Samarra) from 847 until 861. The mosque is located within the 15,058-hectare (37,210-acre) Samarra Archaeological City UNESCO World Heritage Site, listed in 2007. The Great Mosque of Samarra was, for a time, the largest mosque in the world; its minaret, the Malwiya Tower, is a spiralling cone 52 metres (171 ft) high and 33 metres (108 ft) wide with a spiral ramp. The reign of al-Mutawakkil had a great effect on the appearance of the city, for he seems to have been a lover of architecture, and the one responsible for building the great Mosque of Samarra. In a list of his building projects which appears in several different versions, the new Congregational Mosque and up to twenty palaces are mentioned, totalling between 258 and 294 million dirhams. The new Congregational Mosque, with its spiral minaret, built between 849 (235 AH) and 851 (235 AH), formed part of an extension of the city to the east, extending into the old hunting park. The mosque itself was destroyed in 1278 (656 AH) after Hulagu Khan's invasion of Iraq. Only the outer wall and its minaret remain. The mosque had 17 aisles, and its walls were paneled with mosaics of dark blue glass. It was part of an extension of Samarra eastwards. The art and architecture of the mosque were influential; stucco carvings within the mosque in floral and geometric designs represent early Islamic decoration. Additionally, the mosque of Ibn Tulun in Cairo, Egypt was based on the Samarra mosque in many regards. The Malwiya Minaret (Arabic: ملوية‎ malwiyah) is part of the Great Mosque of Samarra. The minaret was originally connected to the mosque by a bridge. The minaret or tower was constructed in 848–852 of sandstone, and is unique among other minarets because of its ascending spiral conical design. 52 metres (171 ft) high and 33 metres (108 ft) wide at the base, the spiral contains stairs reaching to the top. The word "malwiya" translates as "twisted" or "snail shell." The Malwiya was used for the "call to prayer"; its height made it practical for such use. It is visible from a considerable distance in the area around Samarra and therefore may have been designed as a strong visual statement of the presence of Islam in the Tigris Valley. The minaret's unique spiral design is said by some to be derived from the architecture of the Mesopotamian ziggurats. Some consider the influence of the Pillar of Gor, built in Sassanian period, more prominent. The minaret's spiral shape inspired Pritzker Architecture Prize winner Philip Johnson's design for the 1976 Chapel of Thanksgiving at Thanks-Giving Square in Dallas, Texas. In 2005 the top of the Malwiya minaret was damaged by a bomb. Iraqi police said insurgents blew up the top section of the 52-metre (171 ft) tower, which had previously been used by US soldiers as a lookout position, although US troops had pulled out of the site a month before. ^ "Unesco names World Heritage sites". BBC News. 2007-06-28. Retrieved 2010-05-23. ^ See Historic Mosques site Archived 2006-07-10 at Archive.today. ^ Dennis, Sharp (1991). The Illustrated Encyclopedia of Architects and Architecture. New York: Whitney Library of Design. p. 204. ^ D. Hoag., John. Islamic Architecture. Electra/Rizzoli. ^ "مسجد سامرا ؛ برخوردار از مناره ای 53 متری و حلزونی شکل" (in Persian). Mehr News Agency. Retrieved 27 March 2012. ^ a b Kleiner, Fred S.; Christin J. Mamiya (2005). Gardner's Art Through the Ages (12th ed.). Thomson Wadsworth. ^ Kuban, Doğan (1974). "The Development of Early Mosque Architecture". The Mosque and Its Early Development. Leiden, Netherlands: Brill Publishers. p. 16. ^ Kleiner, Fred (2011). "The Islamic World". Gardner’s Art through the Ages: Backpack Edition, Book 3. Boston: Cengage Learning. p. 289. 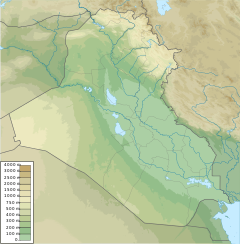 ^ "The city of Samarra was built during the Mu'tokul Abbasid period". Rch.ac.ir. Retrieved 10 February 2019. ^ "Travel Tips: Thanks-Giving Chapel's Islamic Design a Visual, Spiritual Gem in Downtown Dallas". WRMEA. Retrieved 10 February 2019. ^ Schulze, Franz (15 June 1996). "Philip Johnson: Life and Work". University of Chicago Press. Retrieved 10 February 2019 – via Google Books. ^ "Middle East | Ancient minaret damaged in Iraq". BBC News. 2005-04-01. Retrieved 2015-09-03. ^ "Photographic image" (JPG). Cemml.colostate.edu. Retrieved 10 February 2019. Wikimedia Commons has media related to Great Mosque of Samarra. "Samarra Archaeological City". World Heritage Site. UNESCO. 2019. This page was last edited on 12 February 2019, at 13:02 (UTC).